Observers will spin a tapestry of domestic excuses for Mexicans choosing as their leader – succeeding the shamelessly corrupt pretty boy Enrique Peña Nieto – a socialist who once said that Cuban dictator Fidel Castro made the island “a free and independent nation.” Many will blame President Donald Trump for allegedly galvanizing leftist sentiment by championing the enforcement of immigration laws and fair trade deals. Others will declare that the Mexican people have categorically moved left, like their predecessors in Venezuela, Bolivia, and the other players in the region’s “Bolivarian” politics. Nicolás Maduro certainly seems to hope so. Yet these analyses ignore the domestic turmoil that Mexicans have suffered under Peña Nieto, the war-like atmosphere in much of cartel-dominated Mexico and the government’s complacency – even, in some cases, cooperation – with what have essentially become local cartel political regimes. They disregard the domestic hopelessness that brought Peña Nieto’s party, the once-dominant Institutional Revolutionary Party (PRI), back into power after being rejected for the first time in 71 years at the turn of the century. And they especially disregard one key cultural event that sealed the 2018 for any third-party candidate with the funding and organizational capacity to make a splash nationwide. Ayotzinapa won AMLO the presidency. The story was absurd because the evidence clearly refuted it. Experts noted that there was no evidence that the landfill the government claimed the students were incinerated in had ever been set on fire. Foreign experts brought in to confirm the government’s evidence instead found that the police had tampered with or lost key pieces of evidence, fudged with facts to make conclusions fit, and rushed through their conclusions. The government’s incompetence or active obstruction triggered protests of tens of thousands demanding the truth about their loved ones. The incident was far from uncommon; many Mexicans knew someone who knew a civilian who had similarly disappeared in narco territory. “There are thousands of disappeared, thousands of clandestine graves, thousands of mothers who don’t know where their children are,” one of the protesters, Nora Jaime, told the Associated Press that year. The public pressure has, to some extent, worked. While the public does not yet know what happened to the missing 43, the government ordered a new investigation on the issue just last month, this time not led by an obvious affiliate of a drug cartel, unless you count Peña Nieto. The president himself has never been charged with any illicit drug trafficking, but the evidence of Peña Nieto at least tolerating some cartels is overwhelming. An extensive 2016 report found that the Juarez cartel had established shell companies to funnel campaign funds into his 2012 election. That campaign was run by a man with alleged close ties to the Zetas. Instead of using law enforcement resources to target cartels, Peña Nieto’s police used their assets to spy on adversarial journalists (Peña Nieto’s Mexico is one of the deadliest places in the world to practice journalism). When not being accused of taking money from the Juarez cartel, Peña Nieto spent his presidency being accused of plagiarizing his college thesis, being accused of taking money from Odebrecht, the Brazilian contractor found to have traded kickbacks for contracts with politicians all over the Western Hemisphere, or going on television saying that he did not think corruption was that bad in Mexico. Even more Mexico, Peña Nieto’s presidency was too much. The Ayotzinapa incident placed in stark relief a reality that Mexicans had lived with for decades, occasionally challenged (as when they ended 71 years of PRI rule at the turn of the century), but, under Peña-Nieto, largely written off as inevitable. Their government was hopelessly rotten, the major parties were incorrigible, and there was nothing regular people could do about it. Public pressure forced the government to backtrack on Ayotzinapa, inspiring just the right amount of hope to guarantee that anyone not associated with the PRI or PAN could beat them both. Long before AMLO returned to the political scene for the 2018 election, the Mexican people appeared resolved to hand over power to anyone but the usual suspects. While many will point to Venezuela as an analog case because of AMLO’s radical politics, the more apt comparison is Brazil, where “Operation Car Wash” has unveiled that the country’s major parties have no ideology, only lust for wealth and power. Brazilians, like Mexicans, are poised to vote for a candidate with a real ideology not affiliated with a major party, as long as they have a functional campaign team and organized election structure. In their case, however, the best-prepared, least corrupt ideological candidate is conservative Jair Bolsonaro, currently leading in the polls. AMLO’s campaign infrastructure was even more impressive than Bolsonaro’s, perhaps explaining why, unlike Bolsonaro, AMLO’s election was a near given. He had run two national presidential campaigns, done fairly well the first time around, and built enough momentum to secure the PRD nomination a second time. Peña Nieto crushed him enough to prevent a second “legitimate presidency” incident, but allegedly required cartel and Odebrecht help to do it. 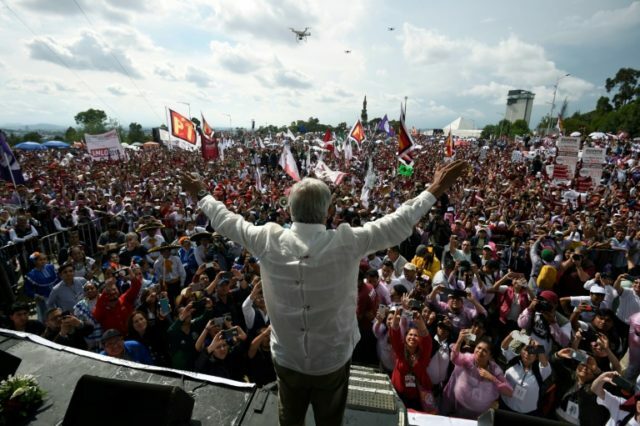 All AMLO had to do to win this presidency was not interrupt Peña Nieto while he was making his mistakes and keep his more extreme comments to himself until July 2. In this, his revamped “moderate” image succeeded. Bloomberg observed that AMLO “adapts speeches to his audiences with the precision of a marksman.” His proposed cabinet nominees are largely unobjectionable, and far from hard leftists. AMLO never interrupted his war on corruption with unwise injections of Marxist propaganda, because he learned twice before that Mexicans largely don’t want to hear it.